Accidental autoclaving of L-glutamine was found to facilitate the Agrobacterium infection of a non host plant like tea in an earlier study. In the present communication, we elucidate the structural changes in L-glutamine due to autoclaving and also confirm the role of heat transformed L-glutamine in Agrobacterium mediated genetic transformation of host/non host plants. When autoclaved at 121°C and 15 psi for 20 or 40 min, L-glutamine was structurally modified into 5-oxo proline and 3-amino glutarimide (α-amino glutarimide), respectively. Of the two autoclaved products, only α-amino glutarimide facilitated Agrobacterium infection of a number of resistant to susceptible plants. However, the compound did not have any vir gene inducing property. We report a one pot autoclave process for the synthesis of 5-oxo proline and α-amino glutarimide from L-glutamine. Xenobiotic detoxifying property of α-amino glutarimide is also proposed. 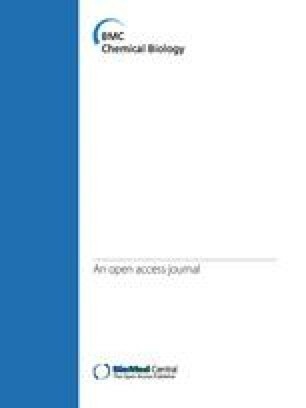 The online version of this article (doi: 10.1186/1472-6769-11-1) contains supplementary material, which is available to authorized users. Indra Sandal, Uksha Saini contributed equally to this work. Glutarimides are the hydrolyzed cyclic imides formed as a result of cyclization of glutamine. These compounds particularly, the α-amino glutarimides are important components of many extremely valuable drugs. The glutarimide moiety is present in a great number of molecules and has a broad spectrum of pharmacological activities. Many glutarimides have been reported to show notable anticancer activity, cytotoxicity against KB cells in vitro, and are also potent inhibitors of P388 murine leukemia in vivo. Since aminoglutethimide inhibits steroidogenesis at the aromatase sites, it is used in treating metastatic breast cancer . Antineoplaston A10 (N-[(3S)-2,6-dioxo-3-piperidyl]-2-phenyl-acetamide) is another glutarimide derivative, originally isolated from human urine. It has remarkable anticancer activity but lacks the toxicity of other common cancer drugs . It has been suggested that A10 acts directly at the genomic level and alters the cellular responsiveness to steroidal hormones . Thalidomides have special clinical value in a number of pathological conditions such as erythema nodosum leprosum, rheumatoid arthritis, HIV-associated oral ulcers, and chronic graft versus host diseases . Both in vitro and in vivo studies have shown that thalidomides have the ability to inhibit tumor necrosis factor-α and its production . FDA has approved this drug for the treatment of erythema nodosum leprosum (ENL) and multiple myeloma . Many glutarimide derivatives are partial agonists of the central nervous system (CNS) and their actions range from convulsive and analeptic (agonist) to anticonvulsive and hypnotic (antagonist). The importance of glutarimide moeties in antibiotics such as the cycloheximides is well known and they act by inhibiting the synthesis of bacterial peptides at the initiation and extension steps . However, the present study elucidates and reports a new function of α-amino glutarimide as a potent facilitator of Agrobacterium infection of generally resistant host plants. The study also shows that α-amino glutarimide is a major product formed as a result of chemical modification of L-glutamine upon autoclaving. Infection of target host and non host plants by engineered Agrobacterium tumefaciens is required for the production of tailor made transgenic plants expressing useful yield and quality enhancing genes . As compared to direct transformation methods, Agrobacterium mediated genetic transformation allows higher frequency of stable transgene expression [10, 11]. Hence this method has been employed to produce a large number of transgenic plants till date. Even the natural barriers that prevent the use of Agrobacterium as a vector for genetic transformation of monocots have now been overcome through the use of several innovative approaches, and several crop plants have been successfully transformed [11, 12, 13, 14, 15, 16]. Yet, quite a good number of crops, particularly, several important ones that exude bacteriostatic or bactericidal leachates as plant defense have remained outside Agrobacterium's host range, and gene transfer into them is largely difficult. It is while targeting such 'difficult to transform crops' for transgenic production by Agrobacaterium tumefaciens, that α-amino glutarimide can prove extremely useful. Aqueous solution of L-glutamine at a concentration of 2.0 g litre-1 (Sigma, India) was autoclaved at 121°C and 15 psi for 20 and 40 minutes and lyophilized to afford GlA20 and GlA40, respectively. The same concentration of aqueous L-glutamine solution that was not autoclaved but filter sterilized served as control (GFs). GlA20, GlA40 and control were subjected to TLC in order to study the structural changes in L-glutamine due to thermal degradation by autoclaving. Samples spotted on TLC plates were run in solvent systems comprising of butanol:water:acetic acid:: 4:1:5 and n-propanol:2-propanol:water:: 4:3:2 followed by heating at 300°C in an oven for 15 minutes. Visual changes in color and Rf values of the spots were noted after spraying ninhydrin reagent on chromatographed TLC plate. The autoclaved samples (GlA20 and GlA40) were also characterized by modern spectroscopic techniques i.e. NMR and ESI-MS. NMR spectra were recorded on a Bruker Avance-300 spectrometer. Mass spectra were recorded on QTOF-Micro of Waters Micromass. The engineered Agrobacterium tumefaciens strain, GV3101 containing the plasmid p35SGUSINT with the gus reporter and npt II selection marker genes was used. To fresh cultures of this strain harvested at an optical density (OD) of 0.6 at A600 nm, 2.0 g litre-1 of GlA20, GlA40 and GFs (as standardized in an earlier study) were added and grown overnight as shake cultures in 20 ml Yeast Mannitol Broth (YMB) in dark at 28°C and 150 rpm for 24 hrs. In another experiment, freshly revived cultures of A. tumefaciens was grown in liquid basal MS medium  containing either of 2.0 g l-1 GFs, GlA20, GlA40 maintained at different pH i.e., 5.2, 5.6, 5.9 and 7.0. Growth in response to 2.0 g l-1 5-oxo proline (purchased from Sigma, USA) in MS and YMB was also tested at these pHs. All the results were confirmed using 1.5% agar solidified YMB and MS medium. For each of these experiments, cultures grown in medium free of GFs, GlA20, GlA40 or 5-oxo proline served as control. A minimum of three replicates per treatment were used. 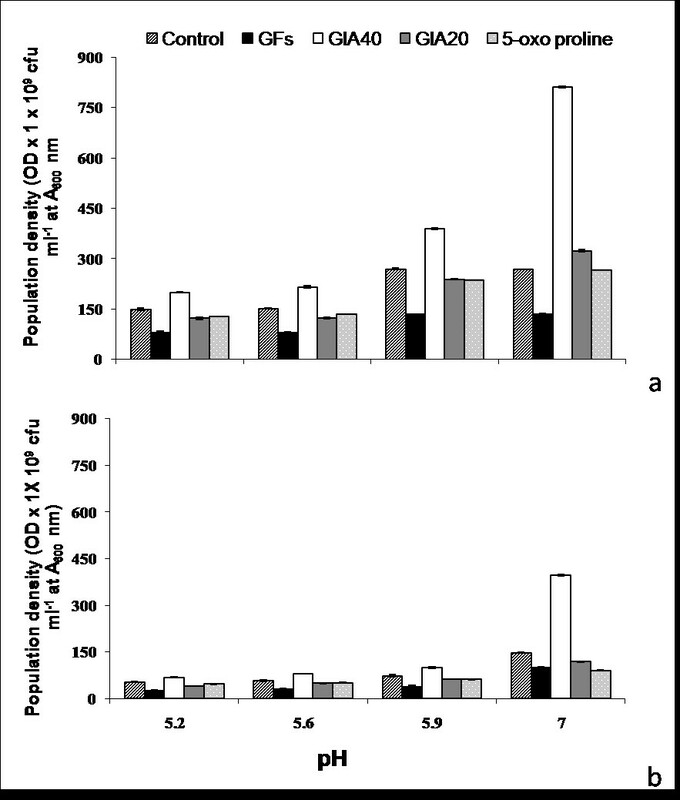 Growth in each case as represented by population density (i.e., a value = optical density (OD) at A600 nm × 1 × 109 cfu ml-1) was measured at regular 12 hr interval for 24 and 48 hrs of incubation in case of liquid and solid media, respectively. Vir gene induction by the autoclaved products was tested using an octopine-type Agrobacterium strain A348 harboring the pSM219 plasmid with lacZ under the control of virH promoter in trans to the wild-type pTiA6 plasmid [18, 19]. GlA20, GlA40 or GFs were added to overnight grown bacterial cultures in YMB. The reporter β-galactosidase activity was measured, and the results were expressed in specific units calculated as described [18, 19, 20]. The popular vir gene inducer AS (100 μ M) was used as a positive control for its maximal vir gene induction ability. The effect of GlA20, GlA40 or GFs on Agrobacterium infection of plants was tested using tender leaves of a number of plant species like Podophyllum hexandrum (Indian may apple), Aloe vera (aloe), Lavendula officinalis (lavender), Rosa sp. (wild rose), Malus domestica (apple) rootstock MM106, Dendrocalamus asper (bamboo), Cynodon dactylon (grass), Zea mays (maize), Oryza sativa (rice), Triticum aestivum (wheat), Aurocaria (ornamental gymnosperm) and Dryopteris (fern). The leaves of Nicotiana tabacum (tobacco) served as control. All the leaves were washed with Tween 20 and surface sterilized using 0.01% mercuric chloride for 5-10 min followed by thorough rinsing in sterile de-ionized water to remove all traces of mercuric chloride. The surface sterilized leaves were immersed for 10 min in fresh overnight grown culture of A. tumefaciens strain GV3101 and co-cultivated for 1, 2, 3, 5, 6 and 8 days at 28°C in dark after blotting off excess bacteria. Basal MS medium containing 2.0 g l-1 of either of GlA40, GlA20, 5-oxoproline and GFs was used for co-cultivation. After each co-cultivation period, cefotaxime at 1 g l-1 was used to wash the explants free of all residual Agrobacterium which were cultured on basal MS medium containing 5 μM TDZ and 10 μM NAA (MSC) at pH 5.6 under culture lab conditions for callus formation. In order to identify the optimal conditions, different pH, i.e., 5.2, 5.6, 5.9 and 7.0 of the co-cultivation medium containing 2.0 g l-1 of GlA40 were also tested. In another experiment, leaves of different plant species (tobacco, Indian may apple, aloe, lavender, wild rose, apple rootstock MM106, bamboo, grass, maize, rice, aurocaria and fern) were also transformed using different densities of Agrobacterium equivalent to 1 × 107, 1 × 108, 1 × 109 and 1 × 1010 cfu ml-1 at A600 nm. These were then co-cultivated on medium supplemented with either of GFs, GlA40, GlA20 or 5-oxo proline at pH 5.6. Agrobacterium infected explants co-cultivated on medium containing 100 μM AS but free of GFs, GlA40, GlA20 or 5-oxo proline supplements served as positive control. A minimum of five replicates with three leaves per plant species were taken for each experiment which were repeated at least thrice. The histo-chemical assay of Jefferson et al. was used to assess the success of transgene delivery into explants. After 1, 2, 3, 5, 6 and 8 days of co-cultivation, explants, treated (co-cultivated on media containing GFs, GlA40, GlA20 or 5-oxo proline at different pH) and control (co-cultivated on media containing 100 μM AS but free of either GlA20, GlA40, GFs or 5-oxo proline) were randomly selected and immersed in assay buffer containing 5-bromo-4-chloro-3-indolyl-ß-D-glucuronide (GUS) followed by vacuum infiltration for 15 minutes. After an overnight incubation in dark at 37°C, the expression of gus reporter gene was scored as blue spots and/or sectors per leaf explant and photographed using a Sony Cybershot DSC-F-828 camera. GUS assay was also done for the leaf explants transformed using different densities of Agrobacterium followed by co-cultivation on medium containing GFs, GlA40, GlA20 or 5-oxo proline as well as control. 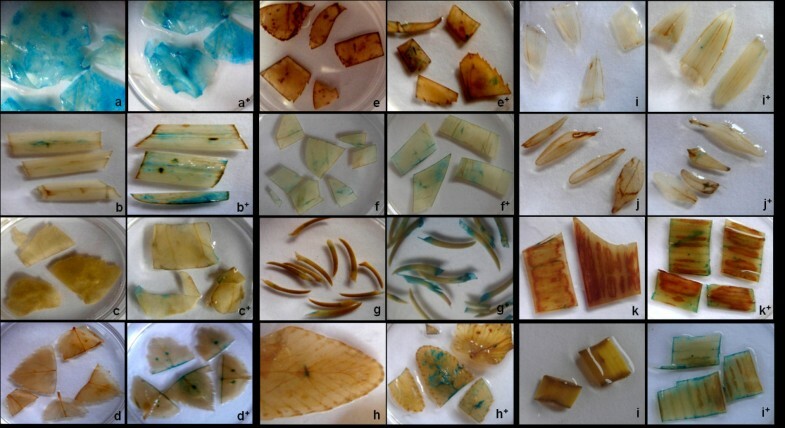 Callus tissue formed on the leaf explants of different plant species transformed in the presence and absence of either GFs, GlA40, GlA20 or 5-oxo proline were selected on MSC containing 100 μg ml-1 kanamycin. As described by Doyle and Doyle , total genomic DNA was extracted from the kanamycin resistant calli (500 mg). These were PCR amplified using 35 cycles of denaturation at 94°C for 1 min, annealing at 55°C for 1 min and extension at 72°C for 2 min followed by further extension cycle of 7 min at 72°C using a programmable Stratagene Robocycler Gradient 40. The isolated genomic DNA (50 ng) was amplified using 200 μ M dNTPs, 1.5 U Taq DNA polymerase and 10 pmol of forward and reverse primers i.e., 5'-GGTGGGAAAGCGCGTTACAAG-3' and 5'-TGGATCCCGGCATAGTTAAA-3', respectively (Bangalore Genei, India) designed so as to amplify a 490 bp fragment of the gus gene). While 50 pg of plasmid DNA served as positive control, DNA from untransformed tissues were used as negative controls. The amplified products were finally resolved on 1.2% agarose gel using a 0'GeneRuler™ 100 bp plus DNA ladder from Fermentas, Life Sciences. Plant species (eg. Podophyllum and Aurocaria) that failed to produce leaf callus were not subjected to PCR. Genomic DNA was isolated from callus tissues of different plant species transformed in presence and absence of α-amino glutarimide. The isolated DNA (10 μg) were digested with Hind III and EcoR I (New England Biolabs Inc. USA) and resolved on 0.8% agarose gel along with a 0'GeneRuler™ 100 bp plus DNA ladder (Fermentas, Life Sciences). This was then blotted onto a nylon membrane (Hybond-N, Amersham Biosciences, Little Chalfont, Buckinghamshire, UK) and hybridized with PCR amplified plasmid gus gene probe labeled with Biotin using Biotin DecaLabel DNA Labeling kit, Fermentas, Life Sciences. The chromogenic substrate BCIP/NBT (nitro blue tetrazolium chloride/5-bromo-4-chloro-3-indolyl phosphate, toluidine salt) was used to detect the hybridization products of the biotinylated probe and the streptavidin-alkaline phosphatase conjugate as blue-purple colored bands. The yield of GlA20 and GlA40 was found in the range of 92-95%. While GlA20 was observed in white crystalline powder, GlA40 was a creamy white powder. The latter was highly hygroscopic and turned into a pale yellow sticky mass within an hour under ambient conditions. TLC analysis of GlA20, GlA40 and GFs showed distinct differences in their Rf values. GlA20 showed only one spot at Rf 0.73, hence, confirmed the formation of only one product (II). However, in case of GlA40, one major spot was observed at Rf 0.70 together with a minor spot at Rf 0.73. The observation suggested the presence of one major compound (III) along with a minor compound (II) in GlA40. The difference in the Rf values of both products from GFs (Rf 0.77) indicated the transformation of L-glutamine upon autoclaving. 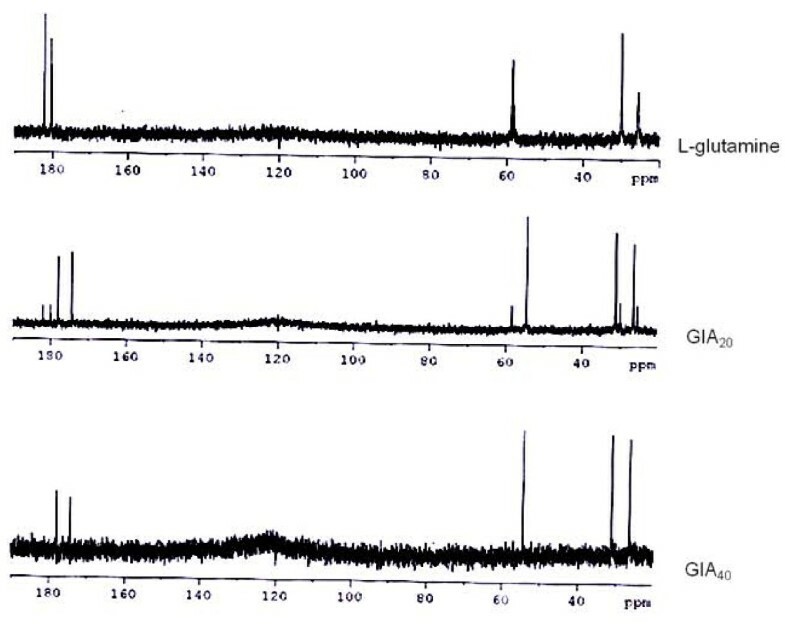 The NMR spectral data (1H, 13C and 2D experiments) provided evidence for GlA20 and GlA40 being two structurally different compounds (Figure 1). NMR spectral data ( 1 H, 13 C and 2D experiments) of L-glutamine and its autoclaved products (GlA 20 and GlA 40 ). GlA20 was identified as 5-oxo proline (pyroglutamic acid, II) on the basis of comparison of NMR and mass spectral data with reported values. Electrospray ionization mass spectrometry (ESI-MS) of GlA20 showed protonated molecular ion at m/z 130 [M+H]+ which corresponded to the molecular formula C5H7NO3. 13C NMR spectrum of GlA40 was dominant with the signals of major product (III) that showed 5 carbon resonances, of which two are observed at δ 182.1 and 180.0 for carbonyls. A downfield shift of these resonances when compared with parent compound (control) indicated presence of a cyclic ring. The other 3 carbons resonated at δ 58.2, 29.9 and 25.5. Considerable shifts in these resonances in comparison to the respective resonances of control (L-glutamine) provided further support for the cyclic structure for product III. DEPT 135 experiment revealed the nature of these three resonances as two CH2 at δ 29.9 and 25.5 and one as CH at δ 58.2. In 1H NMR spectrum, three multiplets were observed at δ 1.93, 2.38 and 4.08, each integrating for two, two and one proton, respectively. The multiplet patterns of these three proton resonances due to mutual scalar couplings indicate that they are connected in series. The coupling pattern was further confirmed by COSY. Electrospray ionization mass spectrometry (ESI-MS) of GlA40 showed protonated molecular ion at m/z 129 [M+H]+ for major product (III) which corresponded to the molecular formula C5H8N2O2. The structural elucidation of compound III finally revealed complete cyclization of glutamine during autoclaving. HMQC and HMBC study further confirmed the loss of a molecule of water to form compound III i.e. α-amino glutarimide or 3-amino-2,6-piperidinedione (Figure 2a and 2b). 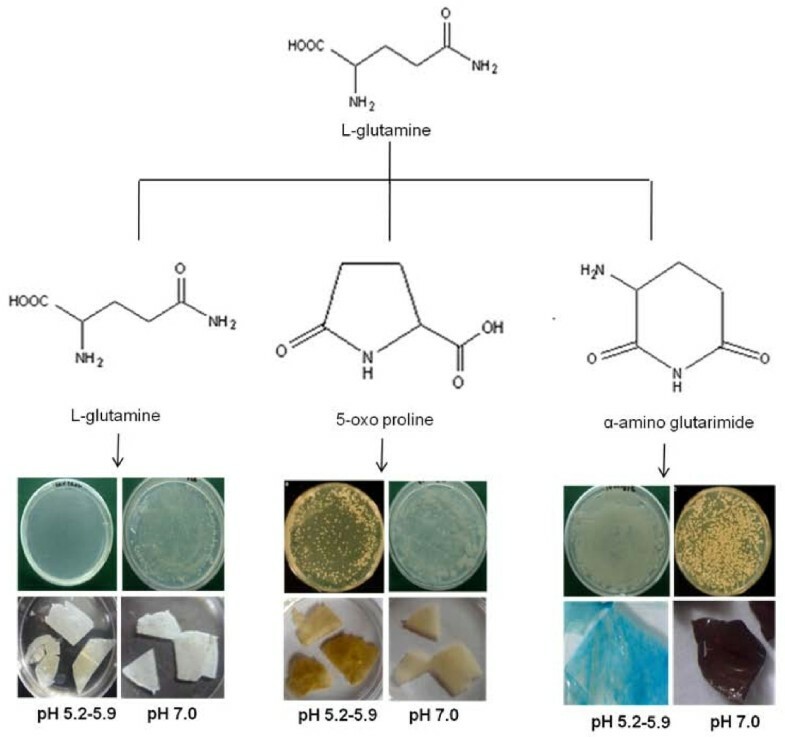 The results clearly suggested that the formation of α-amino glutarimide (III) was preferred over pyroglutamic acid (II) when L-glutamine was over autoclaved. 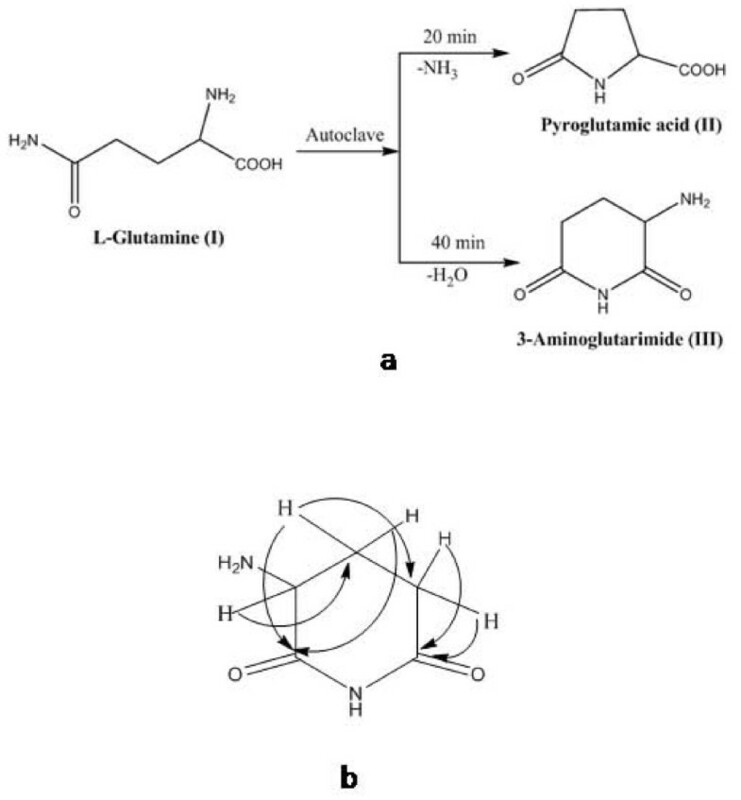 (a) Chemical transformation of L-glutamine into pyroglutamic acid and 3- or α-amino glutarimide upon autoclaving at 121°C and 15 psi (b) Key HMBC of α-amino glutarimide. α-amino glutarimide:1H NMR δ: 1.93 (m, 2H), 2.38 (m, 2H), 4.08 (q, 1H); 13C NMR δ: 182.1, 180.0, 58.2, 29.9, 25.5; ESI-MS m/z: 129 [M+H]+. A. tumefaciens growth was more pronounced at pH 7.0 as compared to acidic pH (5.2 to 5.9), irrespective of supplements (GFs, GlA20, 5-oxo proline or GlA40,), and a similar trend was recorded in both YMB and MS (Figure 3). However, growth was remarkably higher in YMB as compared to MS. As compared to control, maximum growth was recorded at pH 7.0 in the presence of GlA40 (i.e, 3.0 and 2.68 fold in YMB and MS, respectively). While growth in the presence of GlA20 was 1.2 and 0.8 fold, that in the presence of 5-oxo proline was about 1.0 and 0.6 fold in YMB and MS, respectively. Growth in the presence of GFs was always lower than control, irrespective of culture media. At acidic pH of YMB ranging from 5.2 to 5.6, growth was lower than that in the presence of GFs (0.5 to 0.54 fold), GlA20 (0.81 to 0.89 fold) and 5-oxo proline (0.88 fold). However, about 1.4 fold growth was recorded in the presence of GlA40 (Figures 3 and 4). In case of MS, a trend similar to that in YMB was observed. While growth was lower by 0.5 fold in the presence of GFs, it ranged between 0.75 to 0.88 fold in the presence of GlA20 and 5-oxo proline. However, growth in presence of GlA40 was 1.3 to 1.4 fold. A. tumefaciens growth in (a) YMB and (b) MS as represented by OD × 1 × 10 9 cfu ml -1 at A 600 nm in response to 2.0 g l -1 GFs, GlA 20 , GlA 40 and control. Effect of pH (5.2-5.9 and 7.0) on A. tumefaciens growth and GUS expression of explants transformed in presence of GFs, GlA 20 and GlA 40 . Considerably high β-galactosidase activity was recorded in the presence of AS, a known vir gene inducer. However, the activity of control (no additions) was lower than that in the presence of AS (Table 1). While the activities were 132.7 and 132.0 Miller units in the presence of GFs and GlA20, respectively, suppression (130.9 Miller units) was observed in the presence of GlA40. A. tumefaciens growth on leaf explants varied with plant species when transformed with different cell densities and co-cultivated on MS supplemented with GlA40. No growth was observed on any of the explants when transformed with 1 × 107 cfu ml-1 of A. tumefaciens followed by co-cultivation on MS containing either of GFs, GlA20 or 5-oxo proline. Slight A. tumefaciens growth was however, recorded on explants of bamboo, maize and apple rootstock transformed using a cell density of 1 × 107 cfu ml-1 followed by co-cultivation in the presence of GlA40. No explant, except tobacco showed A. tumefaciens growth when co-cultivated on control medium after transformation using cell densities up to 1 × 108 cfu ml-1. However, explants of apple rootstock, bamboo, maize, and rice showed slight growth on control medium at all tested cell densities beyond 1 × 108 cfu ml-1. Growth increased with further increase in cell density i.e., lowest at 1 × 108 cfu ml-1 and highest at 1 × 1010 cfu ml-1 in case of Indian may apple, aloe, lavender, wild rose, apple rootstock, bamboo, grass, maize and rice; and also in the leaf explants of fern and Aurocaria when co-cultivated on MS containing GlA40 (Figure 5). Even in case of control i.e., in the absence of supplements, A. tumefaciens growth was observed on apple rootstock and rice when they were transformed using either of 1 × 109 or 1 × 1010 cfu ml-1. However, A. tumefaciens failed to grow on any of the explants when either GlA20 or 5-oxo proline was present in the co-cultivation medium, irrespective of cell densities, (Sigma, USA). 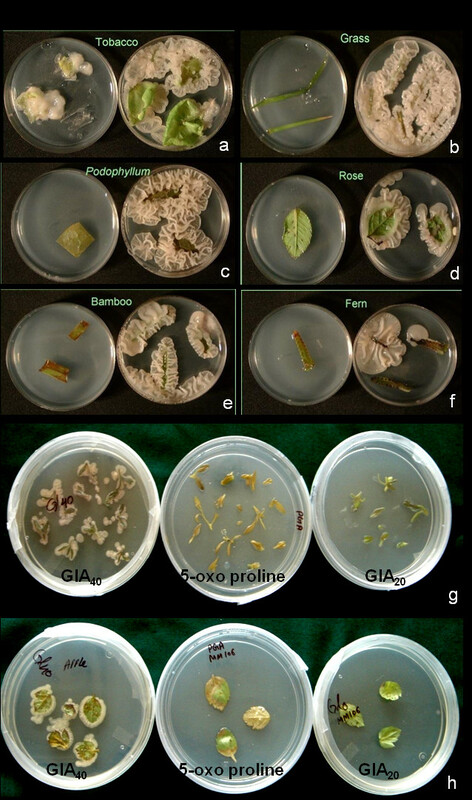 Agrobacterium growth on leaf explants of; (a) tobacco, (b) grass, (c) Indian may apple, (d) rose, (e) bamboo and (f) fern (transformed using 1 × 109 cfu ml-1 followed by co-cultivation on MS containing GlA40 at pH 5.6); (g-h) growth in response to GlA40, 5-oxo proline and GlA20 (g: lavender, h: apple rootstock MM106). When pH of the co-cultivation medium was considered, depending upon the plant species, slight to profuse growth was recorded on or around the explants in the acidic pH range only. In contrast, no A. tumefaciens growth was recorded on or around the explant surface at pH 7.0, irrespective of supplements. GUS expression varied with A. tumefaciens density, plant species or presence or absence of GlA40 (Table 2). Irrespective of the presence or absence of GlA40 in the co-cultivation medium, tobacco showed GUS expression at all cell densities ranging from 1 ×107 and 1 × 109 cfu ml-1. On the other hand, the presence of GlA20 or 5-oxo proline failed to induce GUS expression in all the studied plant species including tobacco. GUS expression improved with increase in A. tumefaciens cell densities from 1 × 107 to 1 × 109 cfu ml-1 in the presence of GlA40 in case of apple rootstock, bamboo and maize; and from 1 × 108 to 1 × 109 cfu ml-1 in Indian may apple, aloe, lavender, grass and rice. However, the best response in terms of strong GUS expression spread over a larger area was recorded, only when 1 × 109 cfu ml-1 of A. tumefaciens was used, irrespective of plant species (Figure 6). Increase in cell density beyond 1 × 109 cfu ml-1 had no effect on GUS expression (or in other words transformation) in case of aloe, grass, maize, rice, aurocaria and fern. On the other hand, with time, the explants turned necrotic due to A. tumefaciens overgrowth at 1 × 1010 cfu ml-1 in case of tobacco, Indian may apple, lavender, wild rose and apple rootstock. GUS expression of leaf explants transformed using 1 × 10 9 cfu ml -1 followed by co-cultivation at pH 5.6. (a) tobacco, (b) grass (c) Indian may apple, (d) apple rootstock, (e) rose, (f) bamboo, (g) aurocaria (h) fern, (i) aloe, (j) lavender (k) maize and (l) rice (+denotes the presence of GlA40). The leaf explants of all the studied plant species showed GUS expression only in the acidic pH range when co-cultivated on MSC containing GlA40. However, the pH optima and the intensity of expression varied with the plant species tested (Table 3). While the leaf explants of tobacco, lavender, apple rootstock, bamboo, maize and rice showed GUS expression at all pH in the acidic range (i.e., 5.2, 5.6 and 5.9), those of Indian may apple, wild rose and grass showed GUS expression at pH 5.6 and 5.9 only. On the other hand, the explants of aloe and fern tested positive when co-cultivated at pH 5.2 and 5.6, whereas, that in aurocaria was best observed at pH 5.6 only. In case of media containing 100 μM AS, but free of all glutamine supplements, longer co-cultivation time was required for the explants of wild rose, apple rootstock, bamboo, grass, maize, rice and fern (Table 3). The only exception was tobacco where < 1 day of co-cultivation was sufficient for strong GUS expression. On the other hand, no GUS expression was observed in explants of any of the plant species co-cultivated at pH 7.0 (Table 3; Figure 4). 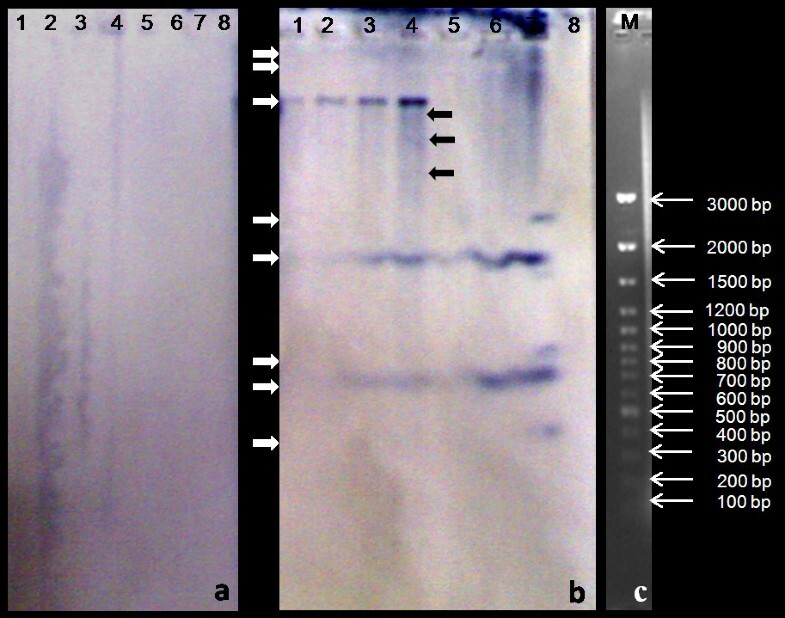 PCR amplification products of about 490 bp corresponding to gus gene were observed in the leaf calli of aloe, lavender, tobacco, rose, grass, fern and apple rootstock and maize provided GlA40 was present in the co-cultivation medium (Figure 7a, b, c and 7d). However, amplification was not detected in the calli derived from explants co-cultivated on either control or on media containing GFs, GlA20 or AS. PCR of genomic DNA from leaf callus showing amplification of 490 bp gus gene. (a) Lane P: plasmid, Lane M: 0'GeneRuler™ 100 bp plus DNA ladder (Fermentas, Life Sciences), Lanes CA-AV: transformed aloe (CA: in absence of GlA40 and AV: in presence of GlA40), Lanes CL and L: transformed lavender (CL: in absence of GlA40, and L: in presence of GlA40), Lane CR: transformants in absence of GlA40 (CR: wild rose); (b) Lane T-T1: transformed tobacco (T: in absence of GlA40, T1: in presence of GlA40), Lanes C1 to C6: untransformed controls (1: aloe, 2: lavender, 3: wild rose, 4: grass, 5: fern, 6: apple rootstock); (c) Lanes R, G, F, A: transformed calli in presence of GlA40 (R: wild rose, G: grass, F: fern, A: apple rootstock) P: plasmid and Lanes C7-C9: transformants in absence of GlA40 (7: apple rootstock, 8: fern, 9: grass) and (d) Lane P: Plasmid DNA, Lane 1: maize transformed in presence of GlA40; Lane 2: transformant in absence of GlA40. Genomic DNA of calli derived from aloe, wild rose, maize, fern, lavender and grass leaves transformed using A. tumefaciens density of 1 × 109 cfu ml-1 and co-cultivated in the presence of GlA40 tested positive in Southern hybridization and distinct purple-blue signals were detected (Figure 8). However, no hybridization signals were observed in case of leaf calli obtained from explants co-cultivated in the presence of AS but in absence of GlA40 (Figure 8a). Hybridization signals were also not detected in the untransformed leaf calli of the studied plant species (not shown). Only tobacco and apple rootstock MM106 showed the hybridization signals both in the presence or absence of GlA40 in the co-cultivation medium (not shown). A distinct single band (> 3 kb) was observed in case of aloe (Figure 8b, lanes 1 and 2). While a distinctly sharp band of > 3 kb was observed along with > 1.5 kb and 700 bp bands in wild rose (Figure 8b, lane 3), four bands above 3 kb and two bands of about 1.8 kb and 700 bp were observed in maize (Figure 8b, lane 4). No signal was observed in case of fern (Figure 8b, lane 5) whereas, two sharp bands of about 1.8 kb and 700 bp were observed in case of lavender (Figure 8, lanes 6 and 7). Three distinct bands (400 bp, 900 bp and 2.8 kb) were observed in case of grass (Figure 8, lane 8). Southern blot of genomic DNA from leaf callus hybridized with Biotin labeled gus gene probe. (a) Control Lanes 1-5: transformants in absence of GlA40 but presence of AS (1 and 2: aloe, 3: wild rose, 4: maize, 5: fern, 6: lavender, 7: grass (b) transformants in presence of GlA40 (Lane 1 and 2: aloe, 3: wild rose, 4: maize, 5: fern, 6 and 7: lavender, 8: grass); (c ) M: 0'GeneRuler™ 100 bp plus DNA ladder (Fermentas, Life Sciences). L-glutamine is a highly thermolabile and non-volatile biomolecule that is chemically modified into different compounds at high temperatures. When present in aqueous solution at pH values that are not extreme, L-glutamine is transformed in two step reactions, first into glutamic acid and then into pyroglutamic acid or 5-pyrrolidone-2-carboxylic acid or 5-oxo proline and ammonia . Besides 5-pyrrolidone-2-carboxylic acid , L-glutamine undergoes pyrolysis at temperatures as high as 300°C leading to the formation of nitrogen containing heterocycles . The additional single methylene group in the side chain allows the free form of glutamine to cyclize and de-amidate spontaneously into pyrrolidone carboxylic acid, a five-membered ring structure found at the N-terminus of many immunoglobulin polypeptides . In the present study also, L-glutamine underwent cyclization to form 5-oxoproline and α-amino glutarimide. However, this occurred when L-glutamine was autoclaved at 121°C and 15 psi for 20 and 40 min, respectively (Figure 2a and 2b). Further chemical investigations using TLC and different spectroscopic methods revealed that irrespective of the duration of autoclaving, both the compounds could be detected in the same sample. However, the amount of α-amino glutarimide was more (92-95%) when the aqueous solution of L-glutamine was autoclaved for 40 min. This indicated the possibility of easy synthesis of α-amino glutarimide simply by autoclaving aqueous solutions of L-glutamine for 40 min. It would be pertinent to mention that in general, the synthesis of the glutarimide ring requires a minimum of 2-3 step reactions [8, 27]. Glutarimides are extremely valuable biomolecules that act as a carrier or vector for transporting biologically active functional groups through cell membranes. The structural features and physiochemical properties of the glutarimide moiety is remarkably similar to the uracil derivatives. Therefore, it interacts with specific receptors involved in transport of uracil and thymine nucleosides across biological membranes [28, 29]. Being a constituent of a large number of other important compounds, the glutarimide moeity possesses a broad spectrum of pharmacological and anticancer properties [2, 30, 31]. Particularly, 2,6-piperidinedione, a glutarimide with an intact imide group (OC-NH-CO) substituted at α and β position in the ring acts as a powerful inhibitor of human rhinovirus 3C protease . However, in the present study α-amino glutarimide was found to have a new function of facilitating Agrobacterium infection of different susceptible and resistant plant species that ranged from host to non-hosts (Tables 2 and 3; Figures 3, 4, 5, 6, 7 and 8). The present study also found that neither 5-oxoproline nor 3-amino glutarmide are inducers of the vir regulon (Table 1). Rather, the compound promoted A. tumefaciens growth resulting in an increase in population density. However, increase in population density beyond 1 × 109 cfu ml-1 was found to have a detrimental effect on transformation efficiency (Table 2). This led us to hypothesize that α-amino glutarimide formed due to autoclaving of L-glutamine was probably responsible for the xenobiotic quenching of the toxic wound exudates from resistant explants as has been indicated in tea . This appears to be so because most of the plant species that were tested in the present study, leached exudates that not only killed the studied explants (data not shown) but also retarded A. tumefaciens growth as has been shown in tea in our earlier study . These bactericidal leachates probably killed or prevented the chemotaxis of an optimal A. tumefaciens population density required for explant infection. Not surprisingly, the possibility of a strong negative influence by the toxic polyphenolic exudates on the chemotactic movement of Agrobacteria towards the explant has been considered . On the other hand, when the bactericidal-explant-exudates were possibly quenched by α-amino glutarimide, the requisite population density of A. tumefaciens which would otherwise have been repelled or killed, were now allowed to move towards the explants for infection (Figure 9a and 9b). A hypothetical diagram showing how α-amino glutarimide facilitates A. tumefaciens infection of non-host explants that exude bactericidal/bacteriostatic leachates. However, the activity of GlA40 was found to be pH dependant. While Agrobacterium growth was enhanced at pH 7.0, infectivity of explants of many of the studied plant species was mostly enhanced at pH 5.6 and some at pH 5.2 and 5.9, but never at pH 7.0 (Table 3 and Figure 4). This indicated the necessity of manipulation of pH of the media containing this compound for its appropriate utilization. Actually, vir gene induction and consequent Agrobacterium infection of plants is best facilitated at acidic pH . However, the pH optima are known to vary with plant species for Agrobacterium virulence and gene transfer [36, 37, 38]. Designing adequate artificial environment and manipulation of wound responses of plant tissues has facilitated successful genetic transformation of many plant species by favoring plant-A. tumefaciens interactions. 5-oxo proline and α-amino glutarimide were synthesized from L-glutamine upon autoclaving at 121°C and 15 psi for 20 or 40 min. Although the compound did not have any vir gene inducing property, α-amino glutarimide facilitated Agrobacterium infection of a number of resistant to susceptible plants successfully. The authors gratefully acknowledge Dr. S. D. Ravindranath, without whose innovative ideas, the conceptualization and successful completion of this work would not be possible. The kind help of Dr A. P. Gupta and Dr. V. K. Kaul in structural elucidation of α-amino glutarimide is acknowledged. Mr. Pabitra Gain is acknowledged for his photography. The financial assistance in the form of project grants as well as Senior Research Fellowships from the Council of Scientific and Industrial Research, India is also gratefully acknowledged. IS and AB conceptualized and designed the study with valuable inputs from AG, JK and PSA. IS also performed the bench work on Agrobacterium mediated transformation of a few representative recalcitrant plants using 3-amino glutarimide. AB drafted the manuscript. US validated the findings and conceptualized the mechanism of action of 3-amino glutarimide in Agrobacterium mediated transformation. DK carried out the Southern hybridization, SS carried out the GUS assays for the different plants and JD carried out the β-galactosidase assays. AG participated in the conceptualization of the chemical studies. JK identified and characterized the compound formed due to autoclaving at different time intervals, NK validated the synthesis of 3-amino glutarimide through autoclaving while PD and BS participated in the validation studies. PSA convened and participated in the overall study. He also provided critical comments. All authors read and approved the final manuscript.